Jonas is 2. If you aren't a parent, I'm not sure how much you remember about being 2, but I'm discovering it means you like to climb and jump on EVERYTHING. Jonas started climbing a lot well over a year ago. My solution to this was to take him to the playground as much as possible, sometimes 2-3 times per week. Yesterday, I went to work at 5:00a.m. like usual. My game plan was to take him to the playground as soon as I got home. Unfortunately, Jonas had other plans. Around 8:00, I get a frantic phone call that he'd fallen flat on his face. Best we could tell, he'd launched himself off the changing table. 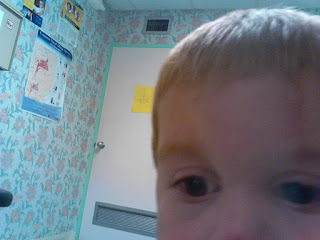 We had to go to the pediatrician, who wrote him a script for an x-ray, to make sure he hadn't fractured any bones in his face. I'm a pretty decent problem solver, so my first instinct was to take out the changing table. Problem solved, right? Not so easily, unfortunately. Boy has decided this is his "jumping" phase. Today he's been jumping on his bed instead. Of course I'm going to tell him no. Tell him he could get hurt. But at some point he'll be in his bedroom alone. I can't hover over him every second of the day and night. I also don't want to put his mattress on the floor, it looks like hell. Meanwhile, my point of writing this blog: I received a phone call from our pediatrician last night with our x-ray results. I should preface this rant by saying I love our pediatrician. She's always wonderful with Jonas, has been from the start. She told me she couldn't see any major fractures, but could not rule out the possibility of a hairline. The tissue in his face was too swollen to tell. She then gave me some helpful instructions, like watching to make sure his behavior doesn't change, waking him periodically to make sure he isn't concussed, etc. Then, she said this: "I'd like him to be more careful in terms of play. He's taken one too many hits lately. (He fell on Saturday while playing with his buddy Terra. Same thing, climbing) I know he wants to act like a normal kid, but he's not." At the time, I didn't fully process what she was saying. I understood what she meant: He's a heart baby. The goal is to keep him healthy. But I sat on it last night, and thought about it more today. YES, he's a heart patient. Of course we need to keep an eye on him. But he's not breakable. I absolutely REFUSE to treat him any differently than I would if he had a whole heart. It's bad enough that he will have limitations later in life that I will have no control over. It is imperative to his development that he not be held back in any way. He is a tough kid, no doubt about it. When he took that hit yesterday, of course he cried. He's 2. I would've cried, and I'm 30. But he got over it so quickly, he was laughing and dancing a couple of hours later like nothing had happened. Why would I rob him of that? So for now, I'm going to let him be a kid. Jonas will fall, and I guarantee he'll pick himself right back up again. I'm not going to baby or coddle him. I hope he will thank me one day. Heart moms: Have you been in a similar situation? How did you handle it?